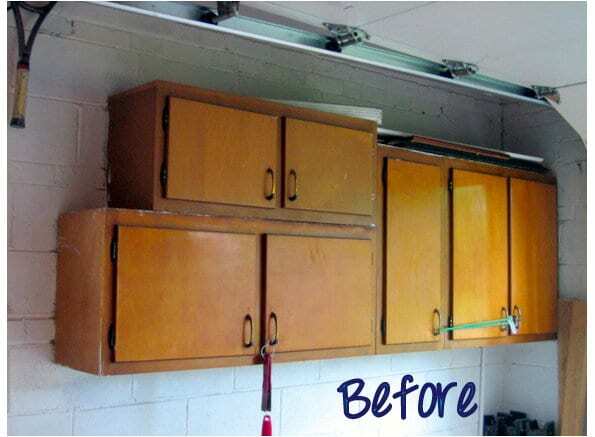 These cabinets in the garage came with the house– they were actually the home’s original kitchen cabinets! 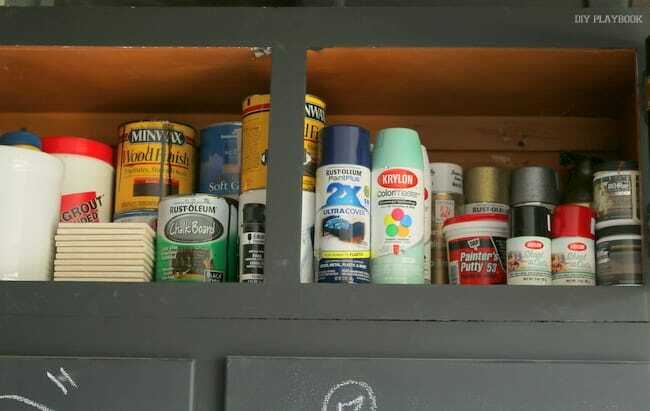 I love, love, love having these extra cabinets in the garage because they provide so much extra storage for smaller items like my tools, paint, garden supplies, etc. And a year later, I still LOVE the chalkboard look! 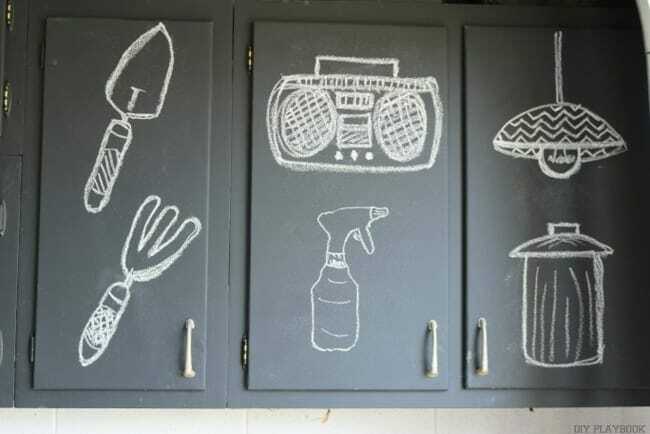 As you can tell, I haven’t even changed the chalk pictures on the front of the cabinets probably because they totally work as is. 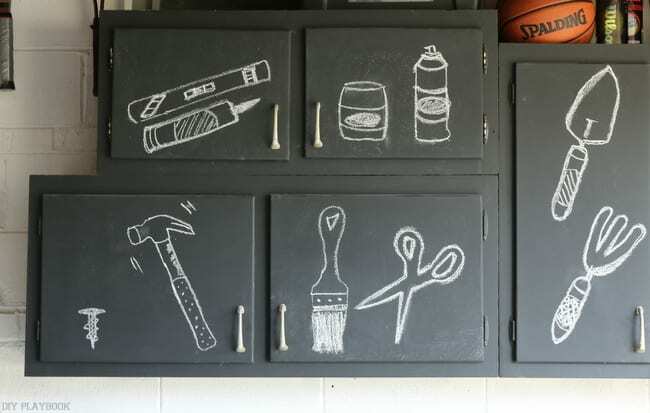 Right after I made these cabinets over, I sketched these little pictures on the cabinet doors to remind me what materials and supplies lived in each cabinet. I am obsessed with this system! But the best part is that these sketches don’t just remind me where to look for supplies, they help remind my better half what item goes where. 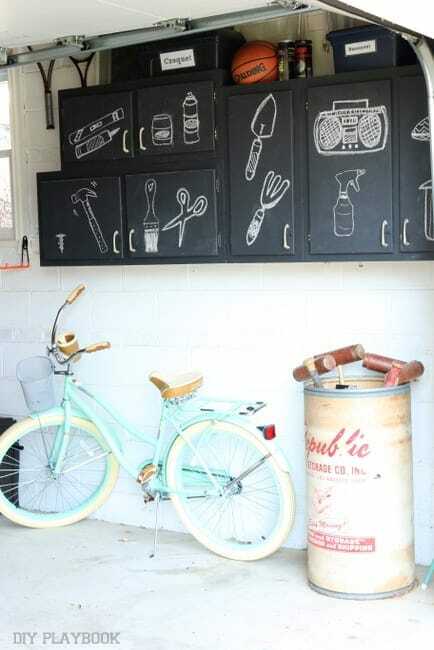 Such a simple solution that totally works for staying organized in the garage. Confession: Don’t be too impressed with the sketches, many of them were literally traced. 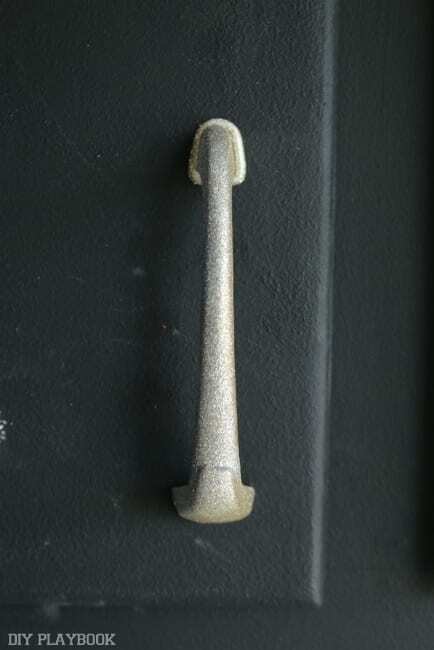 The hammer, scissors, garden tools and spray bottle were traced using the actual items. I just added some fun details to make them look less traced. 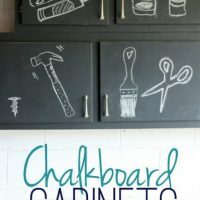 If you’re thinking about doing chalkboard cabinets, or a large-scale chalkboard DIY anywhere in your home, I do want to mention the one negative I have found with chalkboard projects. 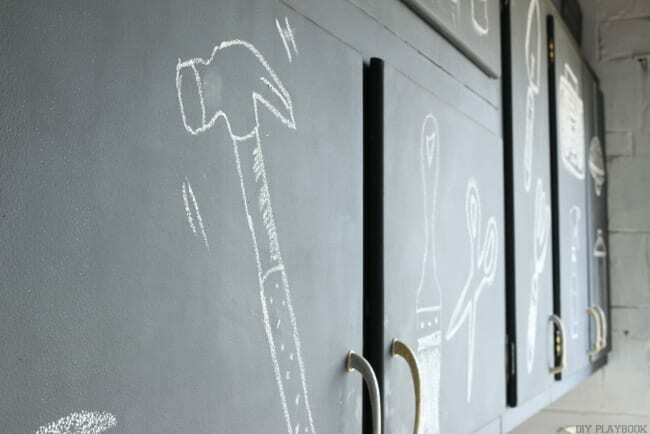 Chalkboard = lots of chalky dust. 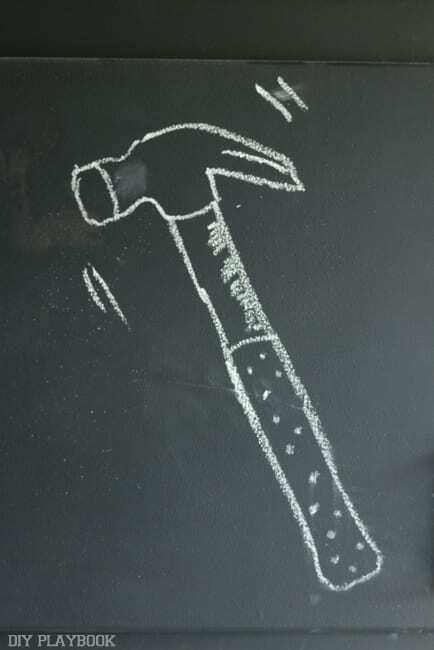 Even with my large DIY chalkboard in my office, changing the design usually produces lots of chalk dust while you draw (LOTS!). Of course after the drawing is complete, the dust is over until next time. 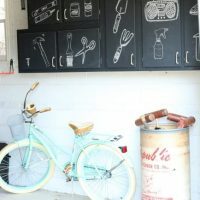 Not a huge deal, just part of the chalkboard package and worth mentioning if you’re thinking of DIY-ing a chalkboard. Honestly, even a year later these cabinets are still pretty organized. 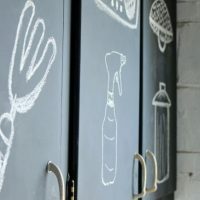 I can’t say that about every nook and cranny in my home, but these cabinets really have stayed pretty organized and I do attribute it to these dorky designs! <– the same designs that led Matt to strongly discourage me from sharing this project on the blog a year ago. 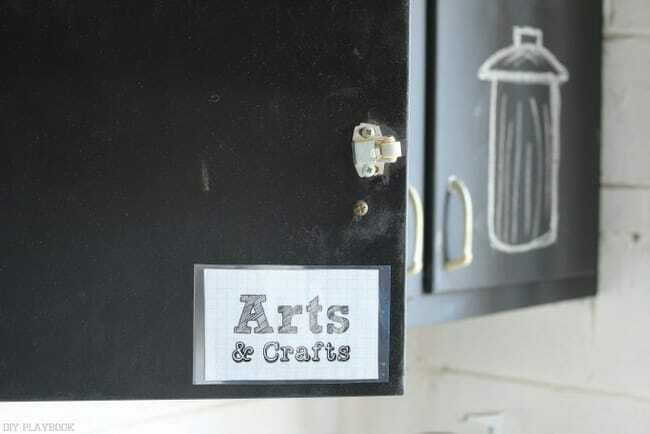 Since the inside cabinet door is not painted with chalkboard paint, I added a few labels to the doors. I simply printed out a label on regular paper and laminated it at a local office store. 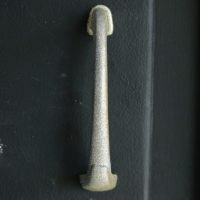 The handles are the original hardware from the cabinets. I spray painted them last year and they are holding up great! (More details here). 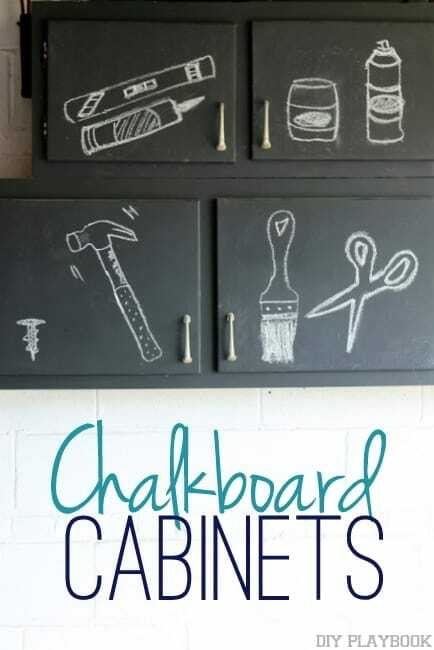 Overall, I’m still in LOVE with these DIY Chalkboard Cabinets. 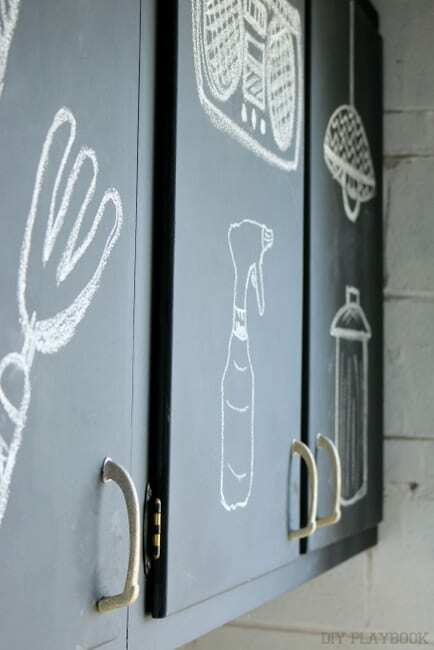 This DIY totally encourages organization and is very garage-friendly. I actually thought about using this same method in my laundry room makeover, but dust in a room that promotes cleanliness just didn’t seem like the perfect match. But in a garage, they totally work! 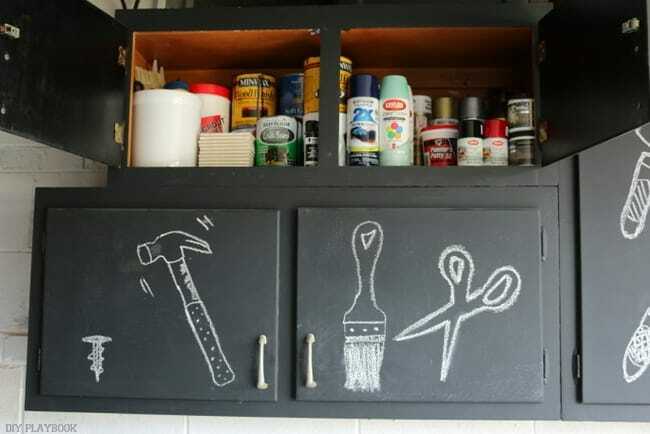 Looking to tackle your own chalkboard cabinets? 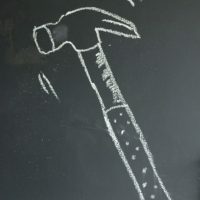 Here’s the Chalkboard Painting Tutorial Part 1 and Part 2. Happy DIY-ing!